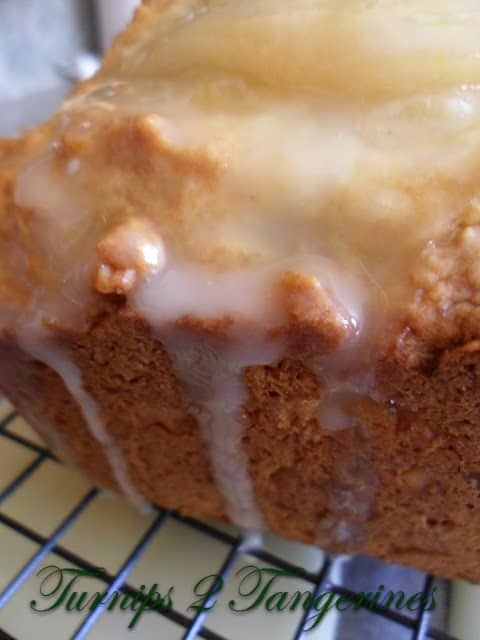 Pear Nut Bread is so delicious. 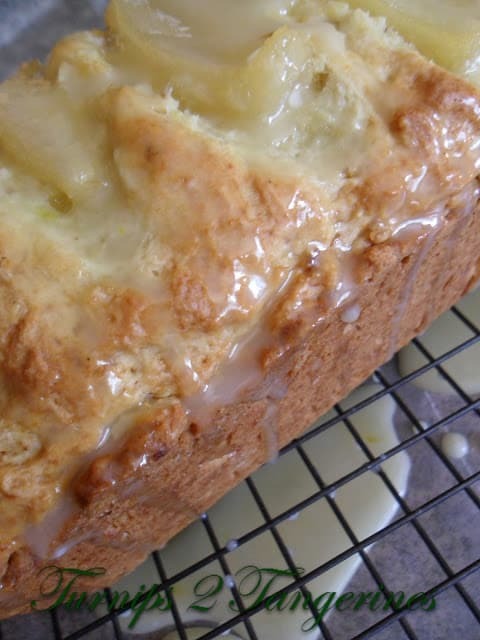 It’s a delicately spiced fruit bread made with juicy canned Bartlett pears. 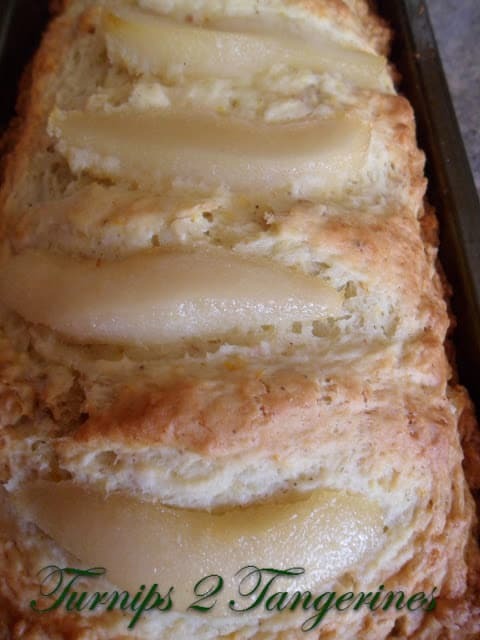 You can make this bread using fresh pears but you will need to slice the fresh pear thinly and replace the pear purée with applesauce or pear baby food. 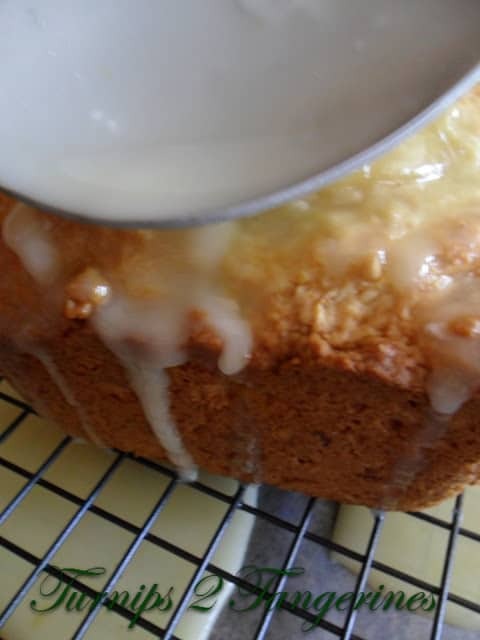 An orange glaze is drizzled over the bread while it’s still warm, then allowed to cool completely. The bread is then wrapped in tin foil, allowed to sit overnight and sliced the next day. I am a huge fan of Quick Breads. Banana bread, cranberry orange bread, blueberry lemon bread, pumpkin bread, zucchini bread and scones. The list goes on and on. Quick bread is a type of bread that is leavened with leavening agents other than yeast. Quick breads cover a wide range. From cakes, brownies, and cookies, as well as fruit/vegetables bread, beer bread, biscuits, cornbread, muffins, pancakes, scones and soda bread. some are made with a dough. They can be large or small, savory or sweet. The major thing that identifies quick breads is the fact that they are as their name implies, quick to make. There isn’t a rest period or rise time as there is with yeast or sourdough type breads. 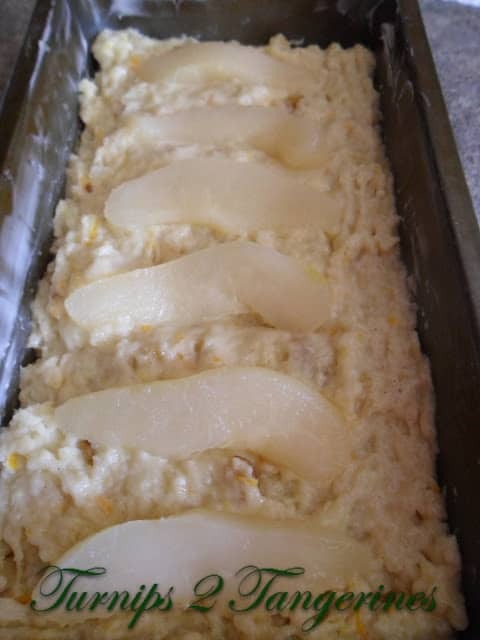 Drain pears, reserving syrup; reserve one pear half for topping. Process remaining pears in a blender or use an immersion blender, process until smooth; transfer to a 1-cup measuring cup. Add as much of the reserved pear syrup as needed to make 1 cup. Reserve remaining syrup for other use. Mix flour, sugar, baking powder, salt and allspice in large bowl. Mix pear puree, oil, egg and orange rind in medium bowl. Add to flour mixture; stir just until moistened. Fold in walnuts; batter will be stiff. Spoon batter into greased 8 x 4 inch loaf pan. 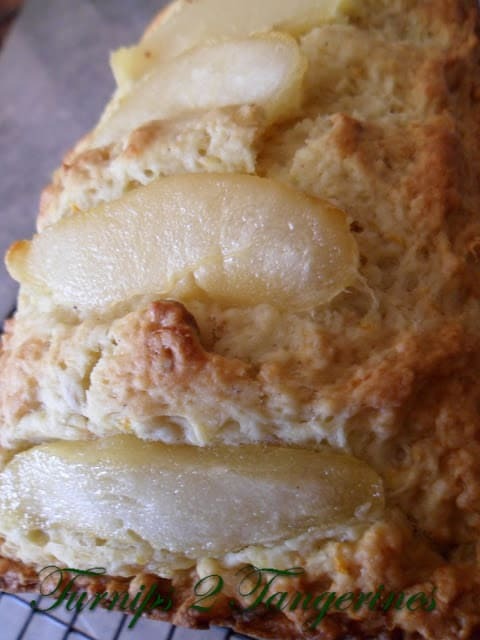 Cut reserved pear half into 6 slices; arrange crosswise in a row on top of batter. Bake in preheated oven at 350º for 50 to 55 minutes or until wooden toothpick comes out clean. Cool in pan on wire rack, 5 minutes. Remove bread from pan; place on a wire rack over a piece of waxed paper. In a small bowl, mix powdered sugar and as much of the orange juice as needed to make a thin, smooth glaze. 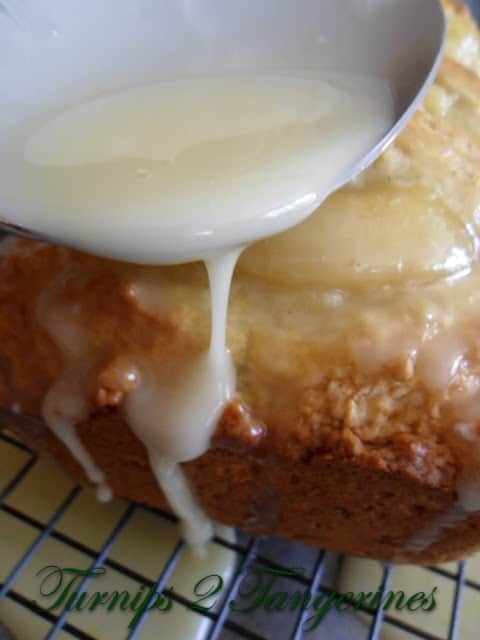 Drizzle glaze over warm bread. Wrap bread in aluminum foil; let stand overnight before slicing. I'm so glad you like the bread. Oh, this sounds so good. 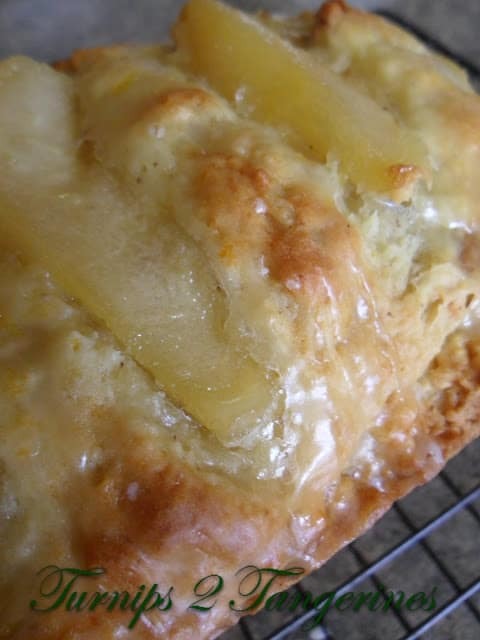 I am pinning since pear season is almost here. Hi Ann~ Thanks for stopping by today! Wow, your bread perks up my morning.It makes me so hungry.Im also a fan of shortbread.Thanks a lot for coming over to my place and I will be back here for sure. Hey Cindy, I'm a new follower from the GFC hop. That looks really yummy especially with the cream on top! I think I just drooled over my keyboard. Lol. I too love quick breads !